This article is about a highway in Australia. For other uses, see Lincoln Way (disambiguation) and Lincoln (disambiguation) § Roadways. 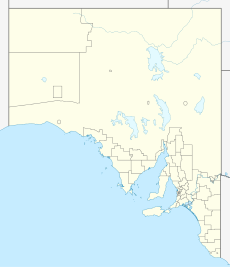 Lincoln Highway is a highway in South Australia which links the cities of Port Augusta and Port Lincoln located on the east coast of Eyre Peninsula over a distance of 327 kilometres (203 miles). It was formerly designated as National Route Alternate 1 and is currently B100. Sealed with bitumen, it has many straight stretches with few steep inclines or declines, and for the most part has a 110 km/h speed limit. It has one lane in each direction, with few overtaking lanes. :8 The highway runs along the eastern coast of the Eyre Peninsula but just so far inland as to allow only glimpses of the Gulf in certain places. The first Europeans to traverse most of this route, in April 1840, were Governor Gawler and John Hill, who explored on horseback from Port Lincoln to the Middleback Range near the location of the site of Whyalla. In general, after leaving Port Augusta the highway passes through hot and arid saltbush-covered and scrub terrain. :15 It soon passes through the largest and most significant town along the route, which is the steel city of Whyalla. Continuing southwest it connects with such coastal towns as Cowell, Port Neill and Arno Bay which have good fishing spots. The terrain here is interspersed with broad-acre grain cropping in suitable localities, and the scenery gets greener the more it heads southwest towards Port Lincoln. Port Lincoln itself is a prosperous fishing port and an important grain terminal serving the Eyre Peninsula wheatbelt. Japanese demand for freshest tuna made many of the fishermen millionaires. ^ a b c A.J. Millazzo, Delegate of the Commissioner of Highways (28 February 2011). "Naming of State Rural Roads - Eyre Peninsula" (PDF). Government of South Australia. Rack Plan 997. Retrieved 23 September 2015. ^ a b "Eyre Peninsula". RAA Regional Road Assessment. Royal Automobile Association. February 2015. Retrieved 27 December 2017. ^ "Property Location Browser". Retrieved 23 September 2015. ^ Google (23 September 2015). "Lincoln Highway driving directions" (Map). Google Maps. Google. Retrieved 23 September 2015. This page was last edited on 26 December 2017, at 23:12 (UTC).